Audu was found guilty on counts on ten counts of the charge and sentenced to seven years on each count without an option of fine. Ayodeji was found guilty on counts 1, 3, 4, 5 and 9 and also sentenced to seven years on each count. 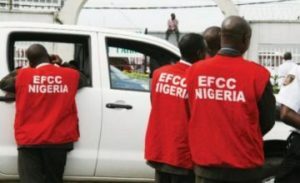 Trouble started for the two accused persons after they allegedly abused their offices by floating companies through which they cornered contracts emanating from the Economic Reforms and Governance Project, ERGP, and Government Integrated Financial Management Information System, GIFMIS, domiciled in the Office of the Accountant General of the Federation. Audu and Ayodeji had pleaded “not guilty” to the charges when they were arraigned on May 26, 2015, thereby setting the stage for their trial. Delivering his judgment, Justice Halilu said the prosecution had proved its case beyond reasonable doubt adding that, as public servants, the convicts abused their offices.